Great news for StarTimes subscribers as the pay-Tv Company acquired broadcasting rights for this year's UEFA Europa League. You can now enjoy watching the 2018/2019 season Live and in HD on your StarTimes Sports Channels and also on StarTimes App. 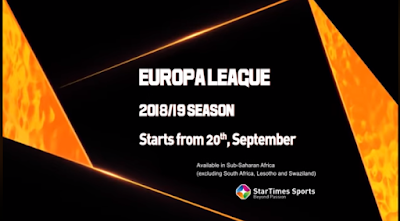 StarTimes has announced its acquisition of 2018/2019 UEFA Europa League broadcast rights through their official Twitter handle. We have secured the right for UEFA @EuropaLeague 2018/2019 season. Get ready for the action, live and in HD on StarTimes Sports. The broadcast, which is expected to commence on September 20, 2018, would see Nigerian, Kenyan, Ghanaian football fans and other Sub-Saharan Africa experiencing the best from Europe's club competition. The 2018–19 UEFA Europa League is the 48th season of Europe's secondary club football tournament organized by UEFA and the 10th season since it was renamed from the UEFA Cup to the UEFA Europa League. As the title holders of Europa League, Atlético Madrid qualified for the 2018–19 UEFA Champions League, although they had already qualified before the final through their league performance. They will only be able to defend their title if they finish third in their group in the Champions League group stage. Enjoy all the action in the UEFA Europa League 2018–19 live and in HD on StarTimes Sports Channels and also on StarTimes App.